When’s the best time to jump into a buyer’s market? How long should you actually wait before you sign on the dotted line? In some areas where the prices are still declining, how can you make the decision if you don’t know how much lower the prices will go? There are a couple of variables that can help you make your move. If you can arrange for a temporary place to live, a smart strategy is sell now, wait a few months, buy your new home. 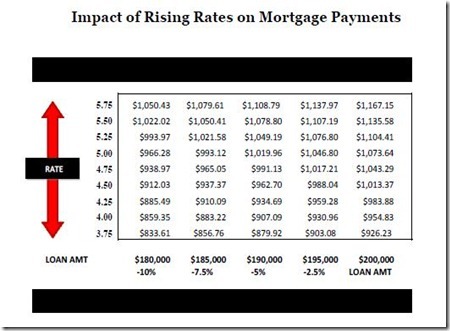 Each 1/2 point increase in your interest rate gives you $25,000 less in purchasing power. Each 1 point increase in your interest rate gives you $50,000 less in purchasing power. 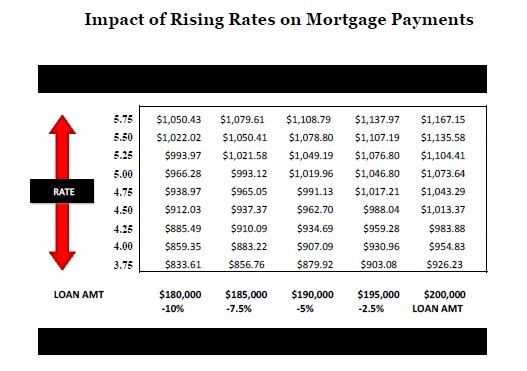 Each 2 point increase in your interest rate gives you $100,000 less in purchasing power. The payments are almost identical. However, the home you can afford to buy a 8.25% is $100,000 less than the home you can afford to buy at 6.25%. If you wait for prices to further decline, the perceived value could be lost due to higher rates. Your best strategy is to weigh all the pros and cons first. Don’t let newspaper headlines dictate your decision! (This great graphic is courtesy of Brian P. Forrester of VanDyk Mortgage Corporation). https://trinityeastlakerealestate.com/wp-content/uploads/2018/03/LC-WebLogo-340x156-300x138.png 0 0 loricrawford https://trinityeastlakerealestate.com/wp-content/uploads/2018/03/LC-WebLogo-340x156-300x138.png loricrawford2011-06-13 12:45:552011-06-13 12:52:27When Should Buyers Buy?